Exfoliating and contouring ritual – a face and body mask that provides intense firming and slimming effect while gently exfoliating. New formula with green coffee beans extract. Exfoliating and contouring ritual – a face and body mask that provides intense firming and slimming effect while gently exfoliating. New formula with green coffee beans extract – contains the combination of the chlorogenic acid and caffeine speeds up the breakdown of the fat cells and prevents the creation of cellulite. Thanks to the high liporeductyl concentration, when used on face product, will improve skin tension and correct the face oval, being extremely effective in a fight against a limp chin. Regular application on problematic body areas will firm the skin and prove to be a brilliant remedy against cellulite and so-called spider veins. The product contains a coffee powder which gently exfoliates the dead skin cells and improves skin circulation, preparing it to absorb the remaining active ingredients to the fullest, as well as making it ready for following skin treatments. The product’s unique formula leaves skin refreshed, properly tensed and moisturized. 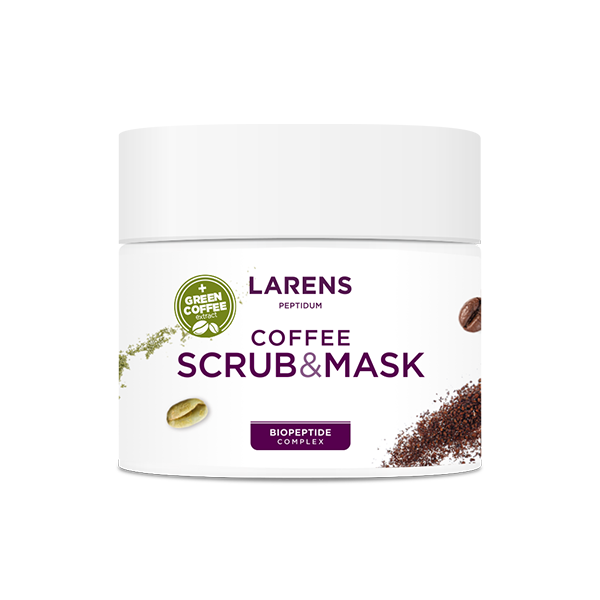 Due to the value of this material, the use of coffee as an independent exfoliator is truly rare. A very few available products of such properties are extremely valuable and highly desirable due to their unique properties, while at the same time they remain environmentally friendly. Coffee – caffeine contained in coffee is known for its anti-ageing properties. It improves skin microcirculation and reduced shades under eyes. It contains polyphenolic compounds that smooth out skin irregularities and counter imperfections. Caffeine is also used to reduce fat tissue and for face modelling. The chlorogenic acid present in the coffee seeds prevents skin cancer. Ground coffee beans make an excellent natural abrasive. Green coffee beans extract – the green coffee beans are not being roasted. Thanks to that they contain large amounts of chlorogenic acid, which is a strong antioxidant. Polyphenols contained in the green coffee beans slow down the skin ageing processes and accelerate the lipolysis (breakdown of the fat cells). Furthermore, the chlorogenic acid contains antibacterial, antifungal and antiviral properties. The combination of the chlorogenic acid and caffeine speeds up the breakdown of the fat cells and prevents the creation of cellulite. Ginkgo biloba (maidenhair tree extract) – thanks to the presence of numerous flavonoids, Ginko has a beneficial effect on the skin microcirculation and strengthens the vascular walls preventing the creation of so-called ‘spider veins’. As it contains flavonoids and terpenes, ginkgo postpones the skin ageing process. Flavonoids increase the fibroblasts synthesis in the skin, and by preventing the Vitamin C oxidation they increase the synthesis of collagen and improve the tissue integrity. Terpenes inhibit the allergy activating and free radicals releasing factors. Liporeductyl – a composition of the most effective active ingredients used in cosmetology to fight cellulite: (caffeine + carnitine + escin + rutabagus extract (Ruscus Aculeatus) + common ivy leaf extract (Hedera Helix) with firming, strengthening blood vessels effect.Thanks to its liposomal formula, the ingredient penetrates epidermis more easily and transports active substances into deeper skin layers. It prevents the creation of the „orange skin” and facilitates slimming. Squalane – by providing nutrients it deeply moisturizes and oxygenates the skin, prevents the damage caused by the UV, age spots, it stimulates the cells growth, exhibits anti-bacterial properties. It makes the skin soft and smooth. Almond oil – moisturizes, improves blood circulation and has anti-ageing properties. Is a natural source of mineral salts, proteins, magnesium and vitamins from A, E, D, B groups. Due to its properties, it proves effective in the fight against stretch-marks and suppressing dark circles under the eyes. Olive oil – in the ancient times called liquid gold, contains a large amount of the vitamin E – a natural antioxidant. It protects the skin against external factors, has anti-inflammatory, anti-acne and anti-psoriasis. Allantoin – facilitates wounds healing, alleviates psoriasis symptoms, has an anti-inflammatory effect, accelerates skin regeneration. It stimulates healing by second intention, meaning the creation of a new connective tissue containing a rich net of capillaries, accelerated wound healing. Easily penetrates the epidermis. Softens it and removed its dead cells. Biopeptide Complex – a complex patented by WellU containing a precious combination of oligo- and polypeptides that ensure immediate, long-lasting hydration in all skin layers. Their use in cosmetology results in elastic body, filling of furrows and unevenness, they also prevent skin sagging. Peptides are used to transport active ingredients into the skin. They demonstrate energizing properties, stimulating cells to produce collagen and elastin. They are helpful in fight against discolouring, they lighten and even the skin colour. Vitamin E – called ‘youth elixir’ by specialists. Characterizes by strong antioxidating properties. Protects the epidermis lipid layer, improves blood supply, helps in dealing with acne and seborrhoea, ensures stability and proper permeability of cell membranes. It nourishes the skin, neutralizes the negative influence of the UV radiation. Has anti-inflammatory and anti-edematous properties, improves the elasticity of the connective tissue. Smooths and moisturizes the skin. Its deficiency leads to keratosis and premature skin ageing as well as the worsened wound healing. American witch-hazel – exhibits strong astringency, antihaemorrhagic and antibacterial properties. Improves skin blood supply and narrows blood vessels. Stimulates cellular division processes – stimulates and accelerates healing and regeneration of an irritated skin, soothes sunburns, prevents infections. It soothes inflammations of a vesicular, reddened and irritated skin. Zemea® (propanediol) – is a natural, skin-friendly active ingredient that in synergy with glycerine provides the skin with desirable prolonged and deep hydration effect as well as better absorbance of active ingredients.